What is the KBS GK-12 Program? In 2010, KBS representatives Getty, Anderson, Gross, Lau, Robertson, and Tinghitella were awarded a grant from the National Science Foundation for a new GK-12 (Graduate STEM Fellows in K-12 Education) Program called the KBS GK-12 Bioenergy Sustainability Project. You can find a slideshow overview and introduction to our project here and a summary here. This program is part of a national network of GK-12 sites funded by the National Science Foundation (NSF) with the common goal of providing science graduate students with skills that will broadly prepare them for their future careers, particularly communicating science with varied audiences. Through interactions with teachers and students in K-12 schools, graduate students are expected to improve communication and teaching skills while enriching science instruction in K-12 schools. For more information about the GK-12 program and links to GK-12 projects in other states, visit the National GK-12 website. 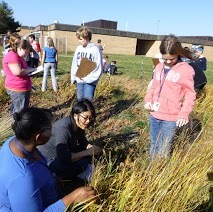 Our GK-12 project has partnered with fifteen rural school districts in SW Michigan, all of whom are part of the ongoing K-12 Partnership at Kellogg Biological Station. In fall of 2010 we established a network of schoolyard research plots (see the BEST Research Network tab) at 22 schools in these 15 districts. The plots mimic those used at the Great Lakes Bioenergy Research Center to conduct experiments testing the sustainability of bioenergy crops like switchgrass and native prairie. Students and teachers at our partner schools are asking the question “Can we grow our fuel and our flowers and butterflies too? Please contact program director Tom Getty (getty@msu.edu) or program manager Sarah Bodbyl (bodbyl@msu.edu) for more information on the KBS GK-12 Bioenergy Sustainability Project. Former GK-12 Fellow awarded with prestigious conservation fellowship. Comments Off on Former GK-12 Fellow awarded with prestigious conservation fellowship. Building Evolutionary Trees: how did New World Oriole colors evolve? Comments Off on Building Evolutionary Trees: how did New World Oriole colors evolve?